When a rocket has been sold to millions of model rocketeers for over three decades, there has to be a reason. With its high quality components, easy assembly and reliable performance, the Estes Alpha has become the all time leading entry level rocket! With a rocket this well known you are bound to get compliments from fellow rocketeers on choosing such a thoroughbred. 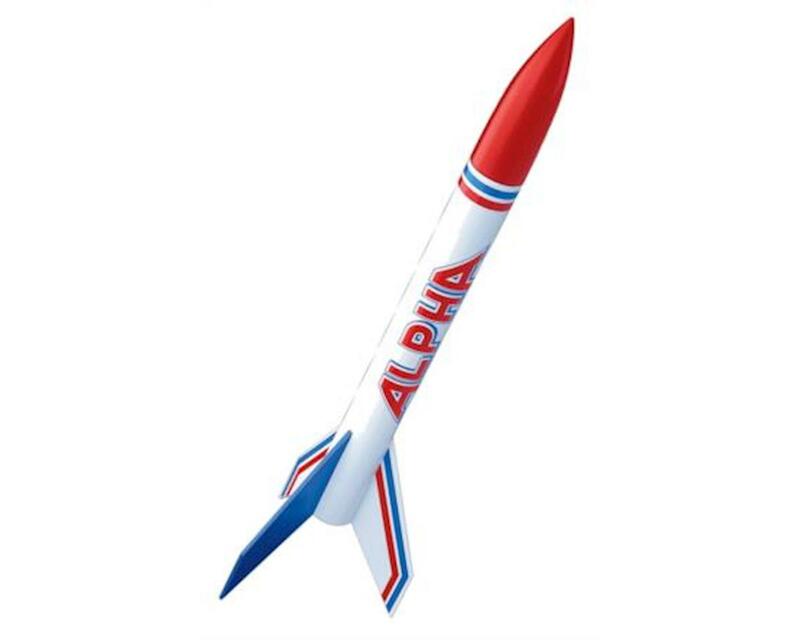 The Alpha is a classic Skill Level 1 kit that includes a one piece body tube, laser cut balsa fins and an aerodynamic nose cone that completes the sleek look. Building this speed merchant takes about an afternoon and flying is just as easy and enjoyable as building this classic. When powered with a C engine, the rocket can reach cloud topping altitudes of 1,000 feet (305 m). Recovery of this aerodynamic wonder is accomplished with a colorful 12 inch (30 cm) preassembled parachute. Its suggested color scheme and classy red, white and blue decals are as American as you can get. You'll feel patriotic building this sleek and colorful rocket as well as flying it. Get an Alpha and start flying today! Assembly, sanding, cutting and painting required. Glue, building tools, finishing supplies, Estes engines, and launch system are needed - sold separately. Recommended for ages 10 and up with adult supervision for those under 12.